Regional Roots Rock can often revert to the formula “Reduce, Reuse, Recycle.” And why not, really? Formulas make people happy, especially when they’re solving for drinking and dancing. Play something that makes people think of O Brother Where Art Thou or Skynyrd and we can all get on until tomorrow. But what separates the bands you would’ve loved squatting in your college town from the bands you ignore as they play a loud brunch restaurant? 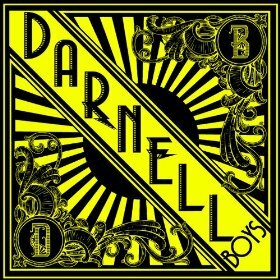 Athens GA’s Darnell Boys muster the magnetism and maturity to make you listen, while cultivating enough shock and melody to keep you from feeling like you’ve heard this before. Their debut self-titled album digs the region’s rich musical well. They haul up a spooky tune called “Bury Me” that makes you remember that Tom Waits rips off plenty of old southern roots in his signature sounds. They’ve got piedmont blues-folk that echoes back to medicine show stuff like Carl Martin and the Tennessee Chocolate Drops. They’ve got wheeling, percussion-less songs that’ll please fans of the first couple Justin Townes Earle records or Adult Boys Thunder Band. Awesome porch music all around–pizza place music, songs for barbecues, Friday nights, or river picnics. This record is mixed remarkably well; it’s nice to feel like you’re getting an accurate, immediate representation of the band on a recording. Definitely a cared-for and lovely product. Find the digital on iTunes, Amazon, or emusic. Grab the CD from Orange Twin Records (also home of stuff by Madeline Adams, Nana Grizol, Elf Power, and Neutral Milk Hotel). Follow the Darnell Boys and their mighty string of southeastern dates on their website, blog, and Facebook. Gives me a Devil Makes Three vibe, I dig it!